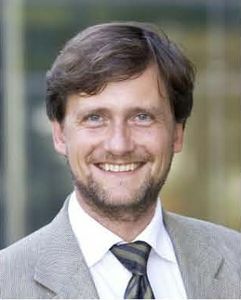 Klaus-Robert Müller (CV) received the Diploma degree in mathematical physics in 1989 and the Ph.D. in theoretical computer science in 1992, both from University of Karlsruhe, Germany. From 1992 to 1994 he worked as a Postdoctoral fellow at GMD FIRST, in Berlin where he started to built up the intelligent data analysis (IDA) group. From 1994 to 1995 he was a European Community STP Research Fellow at University of Tokyo in Prof. Amari's Lab. From 1995 until 2008 he was head of department of the IDA group at GMD FIRST (since 2001 Fraunhofer FIRST) in Berlin and since 1999 he holds a joint associate Professor position of GMD and University of Potsdam. In 2003 he became a full professor at University of Potsdam, in 2006 he became chair of the machine learning department at TU Berlin. He has been lecturing at Humboldt University, Technical University Berlin and University of Potsdam. In 1999 he received the annual national prize for pattern recognition (Olympus Prize) awarded by the German pattern recognition society DAGM, in 2006 the SEL Alcatel communication award and in 2014 he was granted the Science Prize of Berlin awarded by the Governing Mayor of Berlin and in 2017 he received the Vodafone Innovations Award. Since 2012 he is Member of the German National Academy of Sciences Leopoldina and he holds a distinguished professorship at Korea University in Seoul. In 2017 he was elected member of the Berlin Brandenburg Academy of Sciences and also external scientific member of the Max Planck Society. He serves in the editorial boards of Computational Statistics, IEEE Transactions on Biomedical Engineering, Journal of Machine Learning Research and in program and organization committees of various international conferences. (services) His research areas include statistical learning theory for neural networks, support vector machines and ensemble learning techniques. He contributed to the field of signal processing working on time-series analysis, statistical denoising methods and blind source separation. His present application interests are expanded to the analysis of biomedical data, most recently to brain computer interfacing, genomic data analysis, computational chemistry and atomistic simulations. All publications of Klaus-Robert Müller, as well as the research group. To download a complete overview as a pdf file, click here. 4th Workshop on Ensemble Methods, PASCAL workshop, Berlin, 2008.
co-organised with Axel Benner, Torsten Hothorn, Nicole Krämer and Gunnar Rätsch. Methods of Data Analysis in Computational Neuroscience and Brain Computer Interfaces, PASCAL workshop, Berlin, 2007.
co-organised with Guido Nolte, Benjamin Blankertz, and Andreas Ziehe. PASCAL thematic programme: Computational Neuroscience and Brain Computer Interfacing, 2006-2007. Current Trends in Brain-Computer Interfacing, NIPS workshop 2006.
co-organised with Benjamin Blankertz, Matthias Krauledat, Jose del R. Millan, and Roderick Murray-Smith. German Neuroscience Society Meeting Göttingen, 2005.
co-organised with with Birbaumer, Pfurtscheller and Wolpaw. Workshop Proceedings: Genevieve Orr and Klaus-Robert Müller. Neural Networks: Tricks of the Trade, Lecture Notes in Computer Science 1524, Springer Heidelberg, 1998.